United States forward Megan Rapinoe moves the ball during the first half against Jamaica at the CONCACAF women’s World Cup qualifying tournament in Frisco, Texas on Sunday. 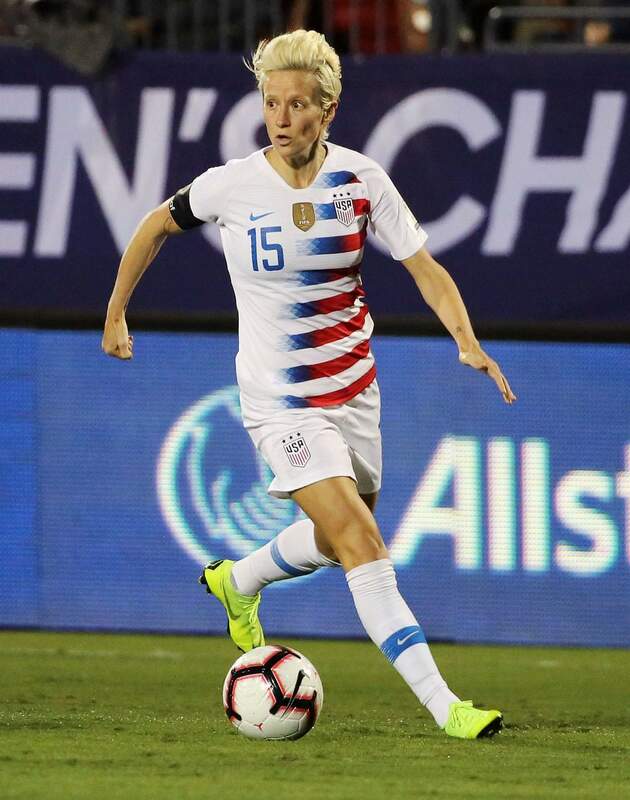 FRISCO, Texas – With the Women’s World Cup less than eight months away, U.S. national team midfielder Megan Rapinoe is dismayed by what she sees as ongoing issues of inequality in soccer. From uncertainty about the use of video review and the amount of prize money, to scheduling other tournament finals on the same day as the championship game, equity issues are getting more attention as the World Cup looms. From Rapinoe’s standpoint, that’s symptomatic of the short shrift paid to the women’s game by FIFA, soccer’s governing body. “And that’s not to say they (FIFA) don’t do anything. They obviously do things for the women’s game. But in the way that they truly care about the men’s game, they don’t truly care about the women’s game,” she said. The United States qualified for the World Cup on Sunday night with a victory over Jamaica in the semifinals of the CONCACAF women’s championship tournament. The top three finishers earn spots in the World Cup, so the U.S. and Canada secured berths with semifinal victories. The two teams will play each other in the championship match Wednesday night. Rapinoe has always been one of the most vocal players on the team. She was among a chorus of voices that criticized FIFA in the run-up to the 2015 World Cup in Canada because the tournament was played on artificial turf, which was considered a slight to the women. So it’s understandable the 33-year-old national team vet would call out FIFA for more recent issues. FIFA has been criticized for scheduling the Women’s World Cup final on the same day as the men’s Copa America final and the CONCACAF Gold Cup final. There have been calls for FIFA to use VAR, or Video Assistant Referees, at the tournament in France. VAR was used at the men’s World Cup for the first time in Russia. Prize money has been an issue since 2015, when the U.S. women’s team received $2 million for winning the World Cup, out of a pool of $15 million. By comparison, the prize pool for the men’s World Cup in Russia was $400 million. FIFA’s Chief Women’s Football Officer Sarai Bareman responded to some of the criticism last week when the organization released its first-ever global strategy for women’s soccer. The wide-ranging policy seeks to grow the women’s game overall – and one aim is to get more women involved in the decision-making processes at all levels. The strategy shows that FIFA is committed to the women’s game, she said. As for VAR, a decision has not been announced. FIFA did not announce its intention to use VAR for the men’s World Cup until just a few months before the tournament. Bareman also confirmed that World Cup prize money would be increased but did not reveal a figure. An announcement is expected later this month at the FIFA Council meeting in Rwanda. She said the prize structure would include “new elements that haven’t existed before in the women’s game” including money to help qualified teams prepare. Sports Illustrated reported last week that the prize pool would be doubled, to $30 million. Rapinoe wanted to know what metric was used in determining the amount – especially in light of the disparity with the men’s. “I mean, I think that they’re probably looking for pats on the back for the increase. They’re not getting any from here. I mean, until they’re really going to take meaningful steps to truly show that they’re caring about the women’s game in a sort of deeper way, I don’t know. $15 million is nothing to them. ... If they wanted to just sort of arbitrarily do it, they could increase it by $100 million,” she said. Rapinoe is not alone. Alex Morgan and Becky Sauerbrunn have also publicly addressed some of the controversies. Coach Jill Ellis first called for VAR at the Women’s World Cup when she visited Russia for the men’s tournament, and during qualifying she has questioned the scheduling decisions. The U.S. team is uniquely positioned to speak to contentious issues. The players fought for and received an improved collective bargaining agreement with U.S. Soccer in 2017 that brings player compensation more in line with the men’s team. And as the No. 1 team in the world, the players’ voices carry weight.